If you use Trello for project management, you can use Hubstaff to track time to individual cards. 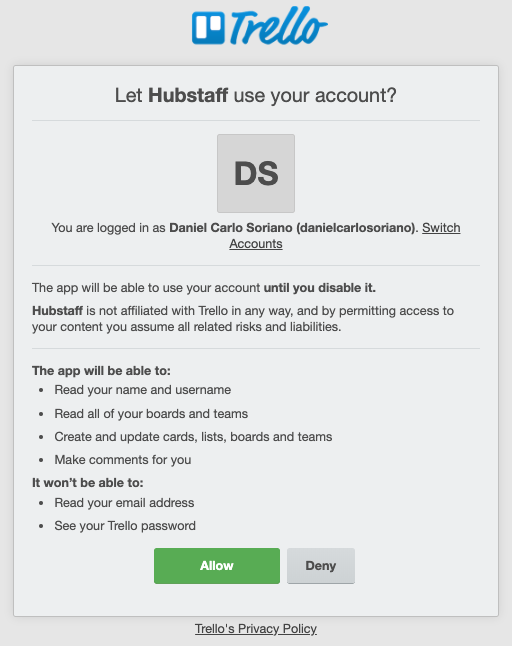 Below we will show you how to add Trello to your Hubstaff account. IMPORTANT: You must connect your account in order to see tasks that are assigned to you. Also, connecting an integration allows for time to be sent back to the third-party software. The first step is to click on Integrations on the sidebar menu then make sure you have selected the correct organization on the top right corner of the page. 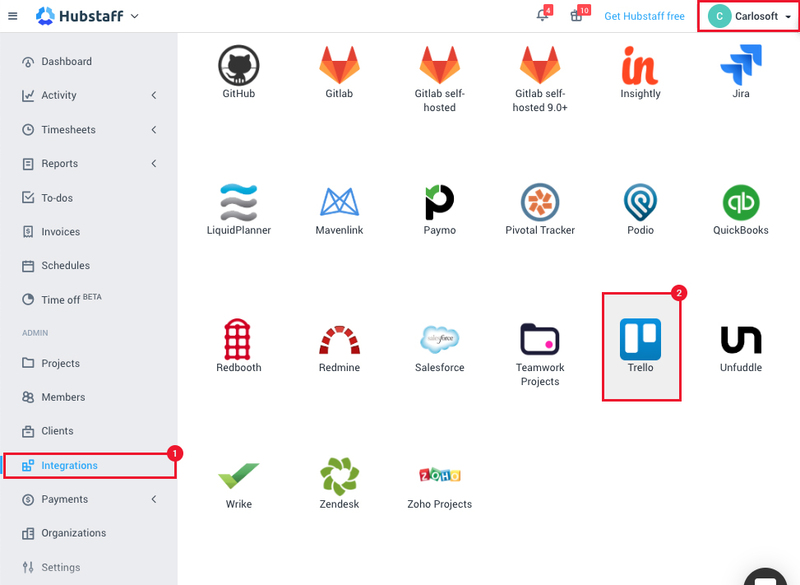 Next, select the Trello logo from the list of available integrations as shown below. You will be asked to give your integration a name, the name is only for your reference. Next, Click the Create Integration button to authorize Hubstaff to access your Trello account (if you are not currently logged into your Trello account you will be given a chance to do so). Important: You will need to have a Trello Team (formerly known as an organization) in order to complete the integration. All boards/cards/users on your Trello Team will be available in the integration. Please see here for how to set up a Trello team if you don’t already have one. After authorization, choose the team you have created in your Trello account that you want to be associated with this integration. All the boards in that organization will be able to be connected with Hubstaff projects. You will next need to link users and projects on Hubstaff with users and boards in Trello, when you are done connecting the users and projects, the integration will be ready to go. The next time a sync runs, the Hubstaff app will start pulling down the different Trello cards assigned to a user. That’s it! You should see your assigned cards appear next to the Hubstaff project you have connected to a Trello board. To track time on a specific card, simply select the card from the list and hit the start button. You will see all your Trello cards when you click the project that you connected in the integration setup. It is still possible to track time to Hubstaff projects without selecting a specific card as well. Tasks might not sync right away. It can take approximately 5 minutes after linking your team. Also, please keep in mind that each time you add a new project or user to your project management tool, the integration needs be refreshed in Hubstaff for those changes to take effect, then link those accordingly. Currently, when you add a new project in the project management third-party provider, you need to access the integrations page in Hubstaff > refresh the projects list > link the new project > assign team members to the Hubstaff project that’s linked to the newly added project. Tasks synchronized with an integration will remain in Hubstaff as a simple task if the integration is deleted.